In Greg Ferenstein’s blog, The Science of Building Trust With Social Media, he analyzes how new technology-based relationships still comply with the same basic psychological framework of “real-world” relationships. And as with any successful relationship, the core component has to be trust. In e-mail, Linkedin and Facebook messages, much of the traditional markers of trust, such as voice intonation and body language, are hidden. Olson finds that when only text is available, participants judge trustworthiness based on how quickly others respond. This is dead on. How many times have you written an e-mail and anxiously awaited a response, clicking that refresh button over and over again? I am guilty of doing that today. How happy does it make you when your tweets are retweeted or replied to? The action of response shows us that someone cares about what we have written, your voice has been heard and is respected and appreciated. This view of trust in social media relationships can help companies even in a time of crisis. For example, if an angry customer is taking out their frustration or concerns by posting negative things on your company’s Facebook wall, or twitter feed, the best way to handle the situation is to pay that costumer the attention they want. Respond. Quickly. A simple “@angrycustomer Thank you for sharing this concern. We are in the process of addressing it and will get back to you soon” tweet would show that costumer that their view is respected. This will allow them to build their trust in your company. As any public relations professional will tell you, the worst thing you can do is say, “No Comment.” This ascends into the world of social media as well. Keep the conversation flowing, be responsive, be timely, build trust. To-Be Lists: The New To-Do Lists? With 2011 kicking off, of course everyone has crafted their highly ambitious New Year’s Resolutions. For some, it may be working out regularly, or spending less money. For others, like myself, it could be blogging more. This evening I was reading through my blog lines, and came across one that jumped out at me as a unique take on resolutions for the New Year. The post is from one of my favorite blogs, the Social Media Explorer titled My Social Media 2011 TO-BE Lists – What’s Yours? I thought that the TO-BE list was a refreshing approach. I decided to take that to heart and develop my own Social Media To-Be List for 2011. To-Be active in the 2-way Twitter conversation by retweeting posts that I find interesting on a daily basis, tweeting back to those who reach out to me, and posting questions to other tweeters. To-Be engaged in the daily informational content that I read on my social networking sites by reposting news/blogs onto my Reddit lines, commenting on blog posts and on-line articles that I find interesting and uploading more video content to my Youtube site. To-Be creative in the content I share by posting different types of news articles on my facebook feed, and tweeting an array of different information- from politics to crafting- to display my diverse interests. What do you think? What are some of your TO-BE objectives for 2011? Post a comment and let me know! Bad Press for PR Folks? This past week as I was chatting with one of the costumers, I mentioned that I had just graduated with a degree in Public Relations in June. His response was not what I was used to, and it threw me off guard. He went on to finger through the newspaper he was reading and highlight each story that was filth, and how it had been undoubtedly pitched to the journalist by a no-good-dirty-rotten-money-grubbing-PR-practitioner. The fact is that there are many bad PR people out there. I see them every day in my inbox and if you have any kind of following on your blog, you probably see them too. The reality is, though, that PR is not the enemy, BAD PR is the enemy. This fellow at my bar was not trying to upset me. He has a right to be upset. And as I listened to his arguments, mostly centered around “propaganda” distributed by the government and big corporations in efforts to gain popular support or money, I agreed with some of what he was saying. After he had finished, I tried to tell him about the PR work that I had done at a local non-profit, in an attempt to prove that PR can be used for a cause other than evil. In this case, I used it to gain community awareness and support for a good cause. He seemed intrigued, but not fully convinced. He told met that was great, but he asked, “When it comes down to it, though, how many of your classmates from U of O would push aside their ethics for a large amount of money to spread filth in the media for one of these big companies?” I was proud to say that I couldn’t think of any of my fellow classmates who would be willing to sacrifice their professional ethics, including myself. Ok, ya, I get it: It’s a terrible time to graduate from college… terrible economy… undergraduate degrees don’t count for anything anymore because everyone has one…. I’ll never get a job… Thank you, I know, I’ve heard it all and frankly I’m tired of it. I am aware that it is a challenging time for anyone to get a job, not just those of us in the public relations industry. But crying about it or feeling discouraged is as pointless as sitting around and burning your resume and cover letters in the fire place while listening to Whitney Houston’s “I Don’t Really Wanna Fight No More” on repeat. I know that as a recent college graduate it’s going to be a challenge. Ok. Great. I’m up for a challenge. Actually, I’m excited about it and I encourage others who are in my position to adopt this mindset: how often is your life going to be so full of mystery and potential? Soon we will be stuck in the routine of our careers and no doubt looking back nostalgically about that time when were were 22 and couldn’t get a job and did god-knows-what to make money in order to pay the minimum on our student loans 6 months after graduation. Don’t get me wrong; I want a job. And I want a job in public relations. But all I’m saying is that all you can do is your best. If you are graduating right now you have your education behind you, your internship experience if you chose to partake, and you need to market yourself to potential employers as someone worth paying. Have an eagle-eyed attention to detail. In my opinion, these tips are pretty straight-forward, and I don’t disagree with any of them. Well, actually, I disagree that you have to honestly enjoy grunt work. As long as you do it, do it well, and do it with a good attitude, I think that’s fine. I know that I have completed a ton of grunt work in the past that I would be lying to myself if i said I actually enjoyed. That is a side-comment though. If I were to add one tip to this list it would be this: Make someone’s job easier. If you are hired it is because someone has too much on their plate. I recently went an international career fair summit and one of the business owners said, “I will never hire someone who says to me, ‘I want to work here because I feel like I could learn so much from you.’ As much as I want to say I care about teaching you, why would I pay you for that? I will hire someone who says to me, ‘I can reduce your workload by taking on this…’ That is a reason for me to pay someone.” That stuck in my head. It makes sense. You need to offer value and be able to prove your value and worth at a company. Bottom Line: When you are trying to get a job: Ask not what you potential employer can do for you, ask what you can do for your potential employer. Week 10 of winter term here at the UofO has arrived, aka the BUSIEST week of the term. 1. http://www.tadalist.com : This is an extremely easy-to-use site. It is a simple structure and creates a list of activities that you check off (or click off) as you complete them. When you are finish a task, it is removed from the list. You can also invite other to add to the list if you have shared activities. The site is free and very easy. Also it is a perfect tool for those of us who like the instant gratification of checking things of lists! 2. http://www.rememberthemilk.com : This site is similar to TaDa but it organizes your tasks into the following categories: Personal, Study, Work. You can prioritize your tasks or postpone them. Also, if any of your tasks become overdue, this tool will send an e-mail reminder. You can share lists with others and publish your lists. 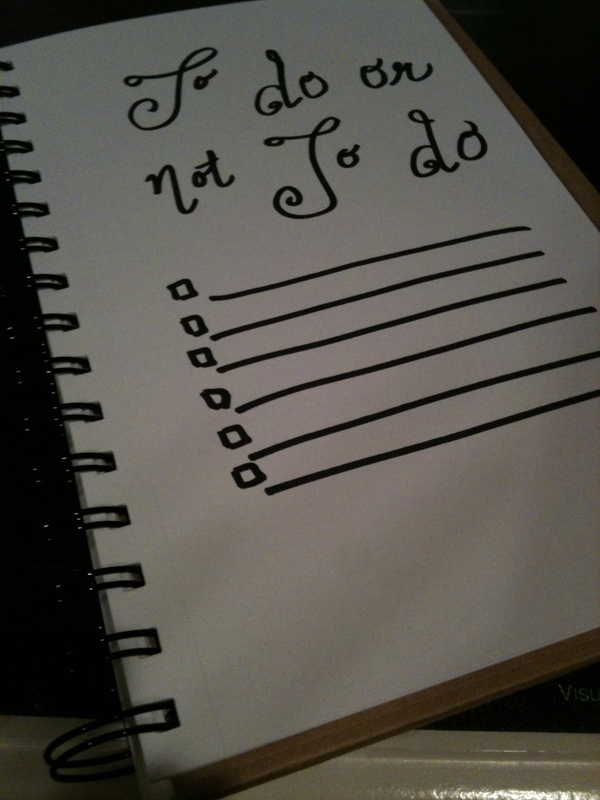 3. http://www.voo2do.com : This site is good for work to-do lists because it allows you to manage many different tasks. Additionally, the tool allows you to publish and share lists with deadlines and has a function to include notes about a task with your collaborators. It also saves your history of tasks so you can keep track of what tasks you have completed. 4. www.zohoplanner.com : Zoho is a more complex on-line organizational tool that has a to-do list feature that is very similar to TaDa. It also offers a feature that allows you to set email reminders, and a notes section. This site does not allow you to publish or share tasks. 5. http://www.backpackit.com : This tool is similar to ZoHo. It allows users to add to-do lists, upload files, photos and notes and it separates all of these tools on an easy-to-navigate site. You can share all of these features or keep them private. Do you know of any helpful on-line organizational tools that I have not mentioned? Let me know by leaving a comment! If Interesting is the Rule, is Informative the Exception? Giving a good interview is an integral part of achieving success in the PR world. On the most basic of levels, most PR jobs (and pretty much every other kind of job) require an interview during the hiring process. Once you’ve gotten over that initial hurdle, more interviews are sure to follow. But in these interviews the dynamic has shifted: you aren’t just representing yourself anymore; you are representing the all important client. In addition, the interviewer is not a potential employer, but an outlet giving you an opportunity you to create the perfect sound bite and (hopefully) generate even more buzz about the aforementioned client. I don’t exactly agree that journalists ask their interview subjects questions, the answers to which they aren’t interested in learning. If you go to an interview to talk about your client’s latest product, you should answer questions about that product and provide information first and foremost. That is what you’re paid to do. Now I don’t think you should be boring in the process, but an interview is supposed to inform, not simply entertain. I think Trunk makes a good point in the last two sentences. The best interviews that I’ve seen always seem the least scripted, and spontaneity does tend to grasp and maintain viewers’ attention. This is another point that I can’t say I agree with completely. I know that for me personally, chirpy is not a trait that I highly value in a person; in fact, the first thing that comes to mind when I read the word chirpy is the word annoying. I do agree that it is important to give the best first impression that you can, by having a positive attitude during an interview- or in any situation in which you are going to be interacting with someone new. However, I would argue that you still need to be yourself. So, if you are fresh-faced, chirpy and upbeat by nature, then I say go ahead and offer that up. But if you’re not, then don’t fake it because it will seem phony and you will lose credibility. I think that the best bet in an interview situation is to be yourself. This week I completed my first podcast. It was quite exciting actually. I learned to use Audacity, which is a great tool for recording and audio- and it’s free! I thought it was a lot easier to use than Garage Band. Anyways, my podcast covered the topic of measuring social media. In this post I will share some of things that I learned while researching this topic for my podcast. Simply, if you participate in social media of any kind whether it be on a personal level, or professional level you are a brand. Whether your brand is your company, agency, product or you yourself- whether you like it or not, or accept it or not, that brand has a reputation in the eyes of others in your social media networks. Of course reputation is important; it can make or break a business. Measuring social media is an effective way to monitor your reputation by listening to what is being said about your brand by Web users. Social media has changed the way that organizations communicate because networks of on-line users are now free to engage in two-way communication and interact with the content that they are presented with. For those of us in PR, it’s easy to get carried away with excitement about these new opportunities- but first we must be aware of the bottom line: It has to be measureable. It has to be measurable. It has to be measurable. You need real humans, members of your audience, listening. You need people who can integrate the various monitoring and research tools, do the correlations, draw conclusions and make recommendations. I like this quote because it’s accurate in describing the complex nature of measuring social media. It is a multi-tiered process of monitoring, analyzing, tracking, and engaging. Traditional marketing or PR folks who try to measure the effectiveness of a social media strategy by simply tracking “hits” on a website, are missing the MAIN point of social media: SOCIAL MEDIA IS ABOUT LISTENING. Well, some fantastic people have developed some great Web-based tools that can help you take the first step, by monitoring on-line buzz about your brand. These Web-based social media monitoring tools, sometimes known as on-line reputation monitoring tools, allow you to plug in keywords and these sites will monitor on-line buzz about these keywords and relay that information back to you. 1. Google Alerts: When I think of monitoring on-line buzz this is the site I think of. It’s free. It’s easy. You type in keywords and Google Alerts will email you either daily, weekly, or as it happens with recent web and news alerts that feature the keywords that you input. The alert also provides you with the link to the article, or Web page. The Web address is http://www.google.com/alerts. 2. Scoutlab: I have read several blogs and reviews about this tool recently and everything that I have read has been positive. The tool provides users with qualitative data about your keywords, rather than simply quantitative data. The site filters the on-line buzz about your keywords into categories negative, positive, neutral, which I think is pretty cool.You can try the service free for 30 days by visiting www.scoutlabs.com/tour but after that you’re going to pay about $250/month for it. 3. Radian6: This is a Web dashboard feature that tracks and monitors social media. This site track blogs, social networking Web sites, photo and video sharing sites, forums, mainstream media, and microblogging sites. I also like the fact that this site allows users to draft and export reports, spreadsheets about tracked findings, which is a helpful way to share information with co-workers and management. Radian6 can be found on the Web at www.radian6.com. No! These Web-based monitoring sites are simply tools that help you measure social media. Remember, measuring social media is a multi-tiered process of monitoring, analyzing, tracking, and engaging. These sites don’t do the work for you because it takes work on behalf of real humans to engage with and measure social media. Just remember the magic word when it comes to social media: LISTEN. Do you have a favorite Web-based social media monitoring site that I did not mention in this blog? Leave a comment! This topic of measuring social media is complex and I would very much appreciate your thoughts!